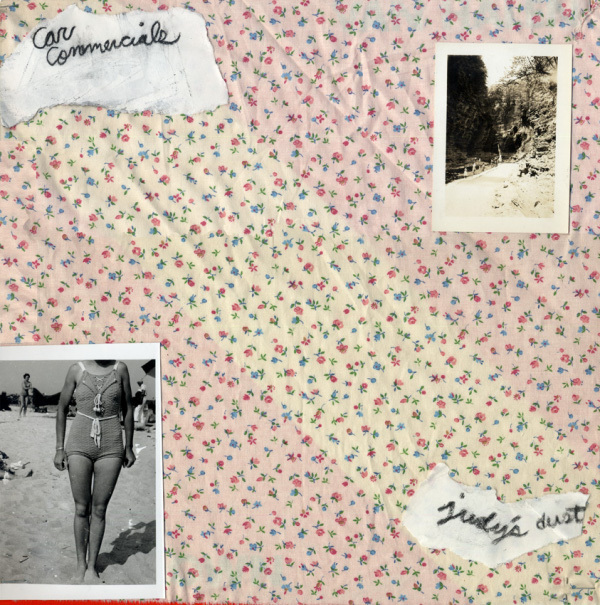 Judy’s Dust is the debut full-length LP by Car Commercials of New Brunswick, New Jersey. Here, the duo of David Sutton (Friends and Family, Current Amnesia, Ladderwoe) and Daniel DiMaggio (Home Blitz) expand on the rock/mumble strategies from the self-released Jar 7” (Leaf Leaf, 2006) and a couple cassettes kicked around the New Jersey underpasses. Contains twelve songs of missing spaces, too much Center Ice, drums and wires, varispeed recording techniques, and facing backwards – all from the other side of the E Street. Limited to 300 copies including 25 with handmade cover art. “Car Commercials’ debut full-length Judy’s Dust marks another album that exists outside of easy classification. Comprised of Home Blitz’s Dom DiMaggio and Friends and Family’s David Sutton, the band breezes through disembodied, hermetic insider visions of mental illness. Their sloppy, noisy instrumentation garners comparisons to a looser Shadow Ring but the overall feel on the album feels more like a male version of Suckdog’s Drugs are Nice. The album follows up the duo’s cassette trilogy with a cleaner but no less odd sound.